The 1290 KTM Super Adventure is perhaps the boldest new entry to the adventure touring segment. The Super Adventure’s uncompromisingly powerful engine is managed by a cutting edge electronics package that helps keep the bike from getting too rowdy. This means that street riding meshes seamlessly with a versatile dual-sport style, making the Super Adventure the perfect ride for wide range of journeys once you have the right luggage. The full-featured Zega Pro system is geared towards off-road adventures and features plastic reinforcements along the bottom and top-side corners, plus a complete range of external and internal accessories for organizing and customizing the gear-hauling capabilities. The Zega Pro panniers come in raw aluminum, silver anodized or black anodized finish. For those looking for clean lines and more simple stylings, take a look at the new Zega Mundo system. The Zega Mundo panniers come only in the raw aluminum finish with external accessories available. They’re the perfect road-touring luggage system. 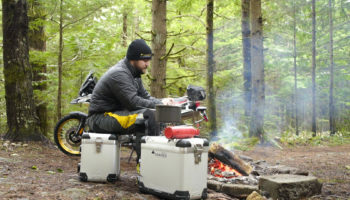 Both of these aluminum pannier systems are dust and water proof, and provide a rugged, reliable, solution to hauling gear on your Super Adventure travels.